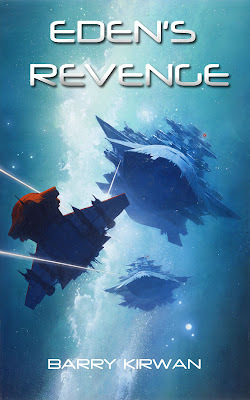 Eden's Revenge is now available on Amazon throughout the galaxy! Micah and Blake must work together again to battle against humanity's nemeses, and Gabriel's son is looking for revenge against the Alicians. This is gritty science fiction, with plenty of new alien life-forms and cultures, as well as more on the Kalarash and the birth of the Hohash. "As with the first two books the palpable characters are the real strength here. You empathize with all of them on some level, even the "bad guys", and have to admire how realistically they have evolved from The Eden Paradox until 18 years later in Eden's Revenge. The storyline leaves nothing to be desired either. Some people cannot write multiple threads and subplots in a coherent and suspenseful manner and some are masters. Mr. Kirwan falls in the latter group, weaving a complex tapestry that astonishes you with its workmanship. The vivid imagination that we have come to expect in the construction of the galaxy and its inhabitants, continues with more worlds and more species that all intrigue and fold into the continuing struggle of Humanity against Alicians, now framed against the larger struggle for survival of the galaxy. There is plenty of action as well, with multiple minor conflicts building up to an outstanding finale. Seriously, the best one of the three, I read the last half straight through--couldn't put it down. You are missing out on some high quality science fiction if you don't pick this one up. Five solid stars for Eden's Revenge." Jacob Millican.